Trivia nights. A handful of questions, a few slips of paper for answers, a running score, and $50 worth of vouchers for food and drink to give away—it all makes for a big night of entertainment. More venues are seeing the value of trivia competitions—luring customers in with the offer of freebies. These contests vary from huge nights run by live presenters to computerized interactive trivia games, where patrons compete against bars around the country via satellite. Either option does one important thing: brings people back. Food tasting. People love food, and if you offer free appetizers or snacks with your beverages, you will draw a crowd. Theater. Traditional theater (or mystery theater) gives customers a chance to look at something and encourages people to stay for an entire performance. Karaoke. The Japanese tradition of karaoke has come on in leaps and bounds in North America in the last ten years, but there's still a big difference between quality karaoke and most karaoke. It's far more than simply putting up a bunch of old songs with some fuzzy video. Your karaoke enthusiasts need variety in the music selection. 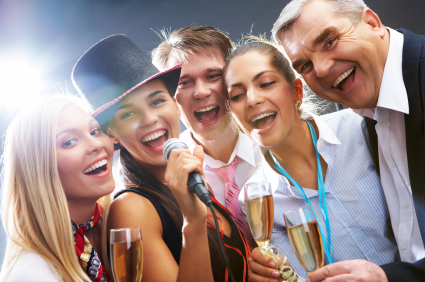 Hire a good karaoke host who can keep things moving and draw a big crowd of listeners. Board games. A Scrabble or Monopoly night might be a simple idea, but it also works! Quieter nights of the week are an excellent time to try out a board game tournament. It instills a sense of community amongst your patrons. Stand-up comedy. It's more than possible for you to find four or five stand-up comedians who will keep your audience laughing without costing you more than a hundred bucks total. Live comedy is a great draw, and it tends to keep an audience planted until the finish. Try an open-mike night and see what you find! Live Entertainment. Eventually all bars consider live entertainment. Few things draw in crowds like a live band. However, knowing which bands to book is not always easy— or affordable. If you have a small bar, consider open-mike night and opening your doors to local bands that need a venue to practice. This will bring some entertainment to your bar at no cost—and entertainers often bring their friends along. For more ambitious booking, you may need to contact managers and publicists of more established entertainers. Prepare yourself by having the stats of your bar—how many customers you can draw, and what the crowd is like—ready. You should give the manager or publicist the reasons why your bar is a great place for the entertainer to perform. Celebrities. Even celebrities will sometimes appear at smaller venues if there is a good reason for them to do so. If a celebrity will be in your area, contact the their publicist and give them the most compelling reasons you can for appearing at your establishment—be it a charitable cause or some other motivation. Celebrities tend to draw a crowd, and if your bar gets a reputation for celebrity sightings, you can expect a good crowd on any given night. Be sure to give them the ultra VIP treatment, and ask for an autograph that can be prominently but discreetly hung behind the bar.